By moving to shield up to five million undocumented migrants from deportation, President Obama hoped to shake off his reputation as the “Deporter-in-Chief” and mend a strained relationship with Latinos. Here Obama succeeded, but there are winners and losers in the president’s plan and deportations will continue, although perhaps at a slower pace. In an address to the nation on November 20, Obama explained he would allow the parents of children who are U.S. citizens or residents to apply for a new program that would defer their deportation for three years at a time. Applicants must pass criminal background checks, have lived in the United States for at least five years, and pay fees and their share of taxes.The biggest winners would be those in “mixed families,” where some members are citizens or legal residents and others are not. The losers are recent immigrants to the U.S. and those who don’t have children who are citizens or residents and would not qualify for help. These immigrants will continue to be vulnerable to deportation. Obama said he acted out of necessity because the U.S. does not have the resources to deport the more than 11 million undocumented immigrants who live here. He added that while the Senate approved a comprehensive immigration bill in 2013, the Republican-led House of Representatives failed to act. Obama coupled his relief with tougher border enforcement efforts, including adding 20,000 more Border Patrol agents and cracking down on companies who hire undocumented workers. He also took steps to allow hi-tech immigrant workers to move or change jobs more easily and to give their spouses work authorization. Obama has used his executive authority to change immigration rules before. 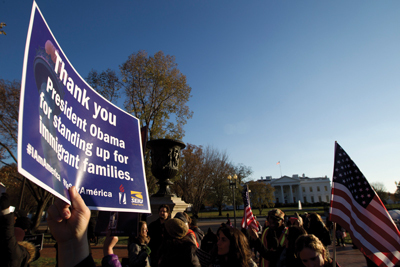 In 2012, he issued a memorandum called Deferred Action for Childhood Arrivals (DACA.) It directed the U.S. Immigration and Customs Enforcement (ICE) agency and other federal agencies involved in the apprehension and deportation of the undocumented to practice “prosecutorial discretion” toward those who immigrated to the United States as children and were in the country without legal status. But many undocumented youth who were brought to the U.S. as children “aged out” because they were older than 31 or were brought into the U.S. after a deadline of June, 2007. Obama has now moved to expand those eligible for DACA so that individuals who were brought to this country as children can apply if they entered before January 1, 2010, regardless of how old they are today. And now DACA relief, which is renewable, will also be granted for three years at a time, instead of two.But the president disappointed many immigrants by not extending deferred action to the parents of those who have won temporary legal standing under DACA. Before the president’s announcement, immigrant advocates and the president’s Latino allies on Capitol Hill say they had the rug pulled out from under them time after time. The biggest disappointment was the sheer number of Obama’s deportations. On Oct. 1 the Department of Homeland Security (DHS) issued its latest report on removals, a document that confirmed what immigration advocates had already guessed, that Obama has deported well over 2 million people during his time in office. The report said DHS deported about 438,000 immigrants from the U.S. in 2013, a record number. The leading countries of origins for those deported immigrants were Mexico, (72 percent), Guatemala (11 percent), Honduras (8.3 percent) and El Salvador (4.8 percent.). DHS also said 44 percent of the undocumented migrant apprehended last year were deported by “expedited removal” or without a hearing before an immigration judge. Now immigrant advocates are praising Obama, even as they recognize it’s a stopgap action they want followed up by a comprehensive immigration bill.